It’s a time-worn tactic employed by floundering elected officials: When criticism builds to the point that your career is at risk, find a scapegoat and blame him for all that’s gone wrong. Anthony Batts, Baltimore’s recently fired police commissioner, became beleaguered Mayor Stephanie Rawlings-Blake’s scapegoat. 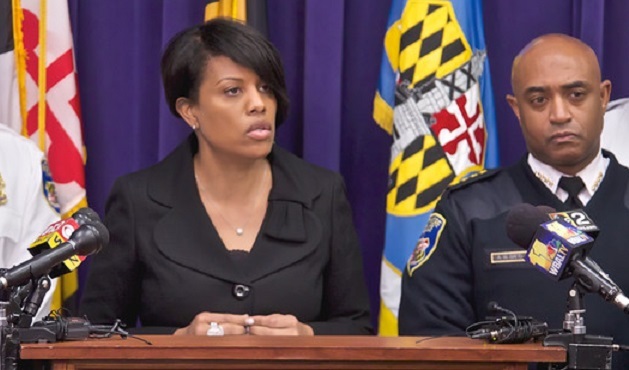 Like author Lewis Carroll’s Queen of Hearts, Rawlings-Blake screamed, “Off with [his] head” in an effort to deflect the crescendo of dissatisfaction with her handling of Baltimore’s unprecedented crime and violence. Here’s what she conveyed in her sudden dismissal of the police commissioner: None of this is my fault; Batts is to blame. So now Batts is out of a job after three years of trying to get a handle on Charm City’s growing epidemic of shootings, drug-related crime and gang violence. Surely Batts’ removal will make all those gruesome homicides go away. History tells us Rawlings-Blake’s ploy is unlikely to work. Firing Baltimore’s top cop won’t stop the street gangs and the drug trade from firing away at their targets. Communities aren’t any safer today with Batts gone. As usual, the mayor hesitated too long before taking action. She had hired Batts and was reluctant to give up on him. She failed to recognize early on that her police commissioner’s “West Coast offense” against Charm City’s criminals wasn’t working. This will become a major issue in the 2016 mayoral race that already is heating up. Rawlings-Blake picked the wrong man for the job. Batts had no familiarity with East Coast urban crime and law enforcement. His experience was mostly in smaller communities in sunny California, not in an aging, densely populated urban core with severe poverty, joblessness and distrust of the police. Batts’ intentions were on point but his execution was lacking. He never gained the confidence of the men and women in blue, or of the community and its leaders. But Rawlings-Blake liked him, in part because of his sterling education credentials. In hindsight, she should have gone with the logical choice back in 2012: Acting Commissioner Anthony Barksdale, the young, behind-the-scenes deputy police chief who devised a community policing strategy that brought the city’s homicide rate to record lows and reversed former Mayor Martin O’Malley’s “zero tolerance” approach that embittered young blacks unfairly targeted and jailed. But Barksdale was a Coppin State dropout who then joined the police force and worked his way to the top through “street smarts” — unlike the Oberlin-educated mayor, who seems to prefer working with folks with degrees from the “right” colleges. Barksdale also had another strike against him. He was the protégé of retiring Police Commissioner Fred Bealefeld, a much-praised appointee of the prior mayor, Sheila Dixon. Rawlings-Blake wanted to separate her administration from the disgraced Dixon, who had been convicted of gift-card theft and forced from office. Barksdale became an unintended casualty. That apt description also applies to many of Rawlings-Blake’s major decisions since then. It might have been quite different if the mayor had moved heaven and earth to get Bealefeld to stay on as police commissioner. The Baltimore native knew the city and its law enforcement team like the back of his hand. His demeanor and policing tactics were working big-time. He was changing the culture of the police force for the better and crime had declined sharply. Barksdale, a born-and-raised Baltimorean like Bealefeld, would have continued those policies. Instead, Rawlings-Blake, as has been her pattern, opted for something new and different — an outsider with credentials who knew nothing about the city. Batts came in, and Barksdale immediately went on medical leave for two years until he could retire at full pay. Also exiting was Col. Jesse Oden, who ran the Criminal Investigations Division. Batts forced out most of Bealefeld’s team and brought in more outsiders, like himself. It was downhill from there. Dixon will claim in the mayoral campaign that she hired the right guy for the job — Bealefeld — and that Rawlings-Blake had gone outside the department to select a new police commissioner who never understood Baltimore and as a result mishandled April’s standoff with angry mobs in West Baltimore. The resulting conflagration, looting and violence staggered Baltimore. Rawlings-Blake’s excessive caution, excessive deliberation, her inability to grasp quickly what needed to be done and her aloofness may well cost her a second term. At the heart of the problem was the mayor’s failure to recognize the importance of retaining and promoting highly experienced and skilled people from the inside rather than turning to outsiders. National searches are overrated. Too often the outsider selected is intent on wiping out existing leadership and policies. Different is deemed better. Past successes are denigrated. Home-grown talent is shown the door. The new leader hires more outsiders to run things differently. It takes them years to figure out the local turf. Morale plunges, confusion reigns and progress — if at all — is slow in coming. Promoting from within is quicker and usually pays hefty dividends. The best Baltimore police chiefs, from Frank Battaglia to Bishop Robinson to Fred Bealefeld, came up through the ranks. But new bosses — in politics and in business — feel a need to show they are in charge by making a dramatic break with the past, even when that move is counter-productive. Rawlings-Blake is now paying the price for insisting on new-and-different. Instead of hiring a “change agent” as police chief, she should have stuck with the Bealefeld-Barksdale policies that were working so well. Acting Commissioner Kevin Davis is both an insider and an outsider. He’s been a deputy commissioner for six months, which gives him a head start. Yet his prior career — an up-from-the-ranks success story — was spent in Prince George’s and Anne Arundel counties. Davis has a firmer grasp of Maryland policing than Batts did. He’s had time to assess the existing leadership. He’s seen what went wrong over the past half-year. But can he institute changes that lower the crime rate, boost police morale and improve community relations? That’s a tall order, especially in the midst of a heated mayoral campaign. Given the failures at City Hall and at police headquarters in April, any move by Davis that lowers the violence and hostile rhetoric would be a giant step forward. If he can get a handle on the crime epidemic, he deserves the job permanently regardless of who wins the April Democratic mayoral primary.